Switzerland is to give Nigeria back hundreds of millions of dollars of embezzled state funds stashed away in the country's banks by former military ruler General Sani Abacha. Swiss banks will be ordered to return $535m under an out-of-court settlement between the Nigerian authorities and General Abacha's family and business associates, the Swiss Federal Justice Department said. Under the deal, a total of around $1bn will be transferred to Nigeria from banks around the world, the ministry said in a statement on Wednesday. In return, the country's authorities have said they will drop criminal proceedings against members of the former leader's family. 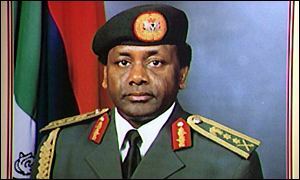 General Abacha, who died of an apparent heart attack in 1998, was accused of stealing some $3bn from state funds in the oil-rich country. Under the settlement, his family will be allowed to keep $100m of the disputed cash. These funds were acquired before General Abacha began his five-year rule in 1993 and "demonstrably do not derive from criminal acts", the statement said. Nigeria asked Switzerland in 1999 to help uncover the financial network it suspected that Mr Abacha had established. In response, the Swiss authorities froze around $670m in bank accounts belonging to Abacha, his son Mohammed, widow Mariam and other relatives. Suspicious money was also discovered in Liechtenstein, Luxembourg and Jersey, and Britain has found traces of around $1.3bn thought to have been handled by domestic banks for General Abacha's family and friends. The Swiss ministry said that the funds to be repaid - currently frozen in various bank accounts abroad - would be transferred to the Bank for International Settlements in Basel. The BBC in no way endorses any emails linking to this story which offer ways to make money. Anyone in the UK receiving such a letter or email is advised not to reply and forward the correspondence to the National Criminal Intelligence Service, PO Box 8000, London SE11 5EN.